The new Spleene X-bar comes with all the must-have features of a modern bar, at the same time it’s very clean and clear. It automatically eliminates the twist after rotations, if you pull the bar down to the harness. This is achieved by a double depower rope guidance. 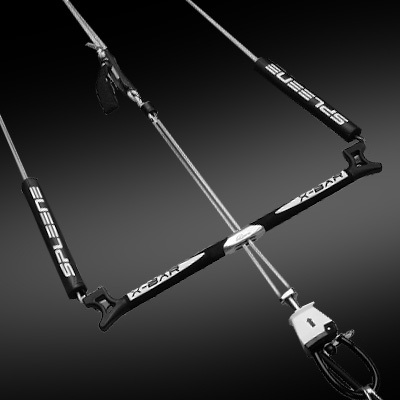 All the same, the X-bar can be powered and depowered smoothly even at full steering deflection. A safety system that brings the kite down to the ground without drag is achieved by an intuitively accessible quick release. Unhooked riding is just as easy as hooked freeriding. In its basic setting the safety release is only established by one front line.